Welcome to Drawing Matters and a new year - a new opportunity to learn a new skill or brush up on existing ones - and what better way to do that than with a 5-day Drawing on the Right Side of the Brain workshop! The cost for the course and all materials is £515 (although each course has an early bird discount opportunity making the course fee £465). There is an additional charge for board and accommodation on the residential courses. This course is now full. Please get in touch if you'd like to go on a waiting list. The Course Fee does not include accommodation or full board. There is an additional cost for this which varies depending on the room. (£415 for 5 nights full board for single ensuite to £345 for 5 nights full board single with shared facilities). Please contact me to find out availability. I find it helpful to look at the work of other artists. These might be Old Masters or contemporary artists - it doesn't really matter. 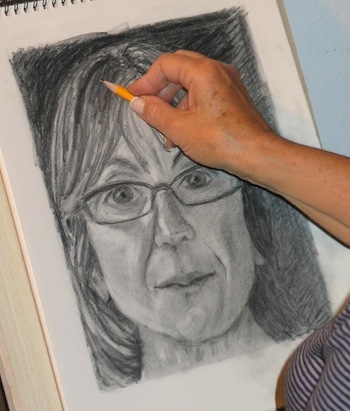 You can look for particular themes such as portraits or landscapes or perhaps search by style or medium. As well as using the internet to search via google, have a look at websites like Tumblr or Pinterest. These can be really great ways to connect with artists' work and can take you along some random paths with great results. Go and explore! Try something new! Too often we get stuck because we set unrealistic expectations for ourselves. When we try something new we approach it with 'beginner's mind' - we have no expectations of being at a particular standard and even better, as a novice we can make mistakes because we don't know 'the rules'. Letting go of our inhibitions and just having a go as if we are a total beginner is a great way to get excited about drawing again. Experiment with different media - charcoal, oils, collage, pen and ink, printmaking... the list is endless! Take a class. I find it really helpful to have something timetabled. When I've got a class scheduled I'm taking it seriously and it has to be something pretty major that causes me to miss it. Make your art work a priority and commit to an ongoing group of some kind. You can always do this informally with a buddy - agree to meet at a particular time and day each week and regardless of whether the other person shows up or not, make sure you do! Look back through previous work. Notice what you like and how you improved. Use this as a starting point. What interests you? What would you like to explore? Don't be afraid - we can always start again and if we seem a little rusty, with practice we will quickly feel as if we haven't had a break at all!